On Jan. 30, the National Centre for the Performing Arts (NCPA) hosted its eighth annual Spring Festival concert, part of the "I Love Beijing – Citizens New Year Party" series. The concert brings regular citizens and professional artists together to perform in celebration of Chinese art and culture. This year's performance, which also celebrated the 70th anniversary of the founding of the People's Republic of China, was more ambitious than ever. The enormous scale was evident in the opening act as six citizen choirs, comprised of over 300 people, sang "Into the New Era." A combination of choral groups, instrumental concertos and the China Film Symphony Orchestra showcased a diverse range of musical proficiency. Together they performed many well-known compositions including "The Song of the Yangtze River" and "Ode to the Motherland." Li Yang, the lead singer of "Ode to the Motherland," is a member of the China National Symphony Orchestra. It was her fourth time participating in the New Year's party. She spoke of how this year's unique combination of performers created a special event. "The chorus and the symphony orchestra work together to bring a unique charm to the performance. This is a new endeavor for all the performers and has brought a fresh feeling to this year's concert." Many of the renditions featured original takes on classic compositions. For example, the China Film Symphony Orchestra and members of the China Oriental Song and Dance Ensemble and the National Peking Opera Company collaborated to expand and adapt the Mongolian folk song "Horse Racing." The new version was faster and more technically demanding than the original. A boys' chorus from the NCPA had the audience singing along when they performed melodious renditions of "Nanping Evening Bell" and "My Deskmate." The Beijing Traditional Orchestra also performed Chinese-inspired percussion music with two energetic performances. The show was not limited to Chinese compositions. Yao Liang and Liu Zhao from the Beijing West Philharmonic Orchestra performed "Csárdás" by the Italian composer and violinist Vittorio Monti. The fast and enthusiastic rendition brought much excitement to the room. 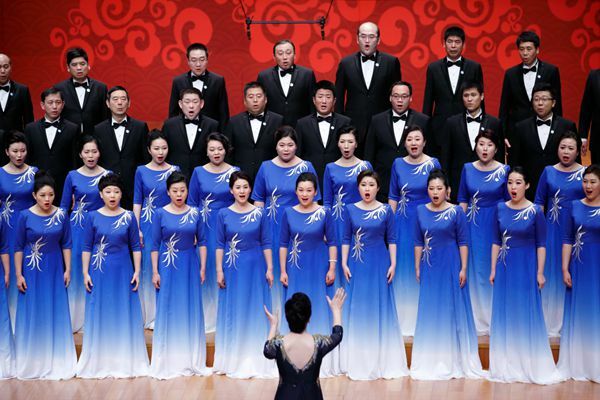 This year's New Year's concert also added more young faces than previous years, with 65 children from the Shijingshan Children's Choir performing "Song of the Red Star" and "We are Communist Successors." The NCPA hosted its eighth annual Spring Festival concert, featuring an exceptional combination of choral groups, instrumentalists and talented singers.